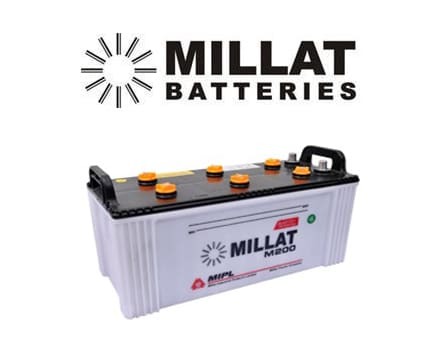 Millat battery is a product of Millat Industrial Products Limited, which is a subsi diary of Millat Tractors Limited manufacturers. They are also a manufacturer of Massey Ferguson tractors in Pakistan. They are manufacturing a wide range of battery types including Deep Cycle, CNG Range, UPS Range, and general types of batteries in Pakistan. Each battery has its own specifications and usage. Currently, they are making batteries of Lead-acid. 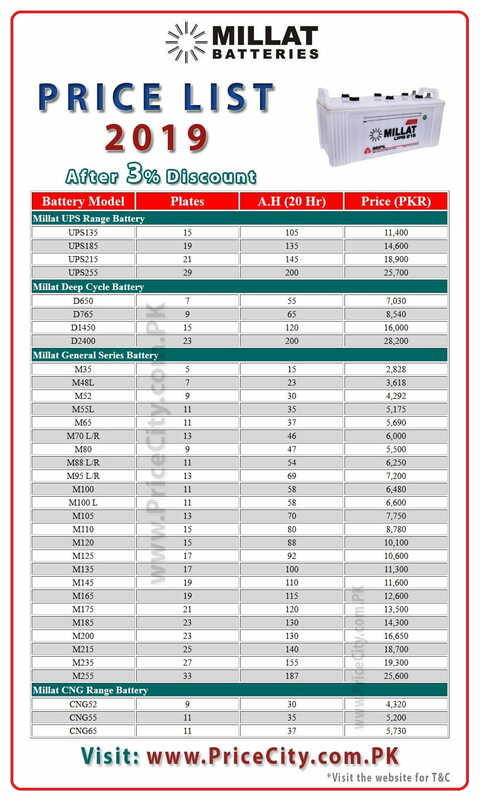 Below you can read the Millat battery price list 2019 and specifications of each battery. 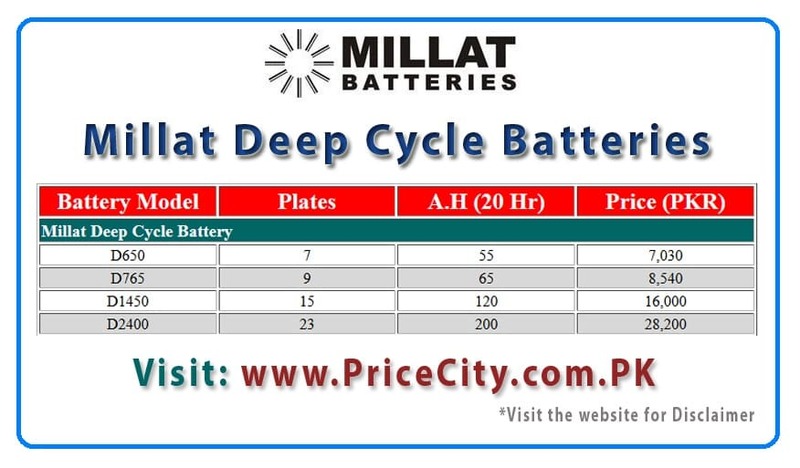 You can buy these products from the Millat battery dealers all around Pakistan including Lahore, Karachi, Faisalabad, Bahawalpur, Bahawalnagar, Arifwala, Burewala, Yazman, Rawalpindi, Multan, Peshawar, Islamabad, Gujranwala, and some online sellers, stores (OLX, Daraz, Pakwheels, etc) are also selling these batteries. You can also contact the company for the dealership or franchise in your city. You can use these batteries according to your needs. Its UPS and deep cycle battery is specially designed for working with UPS, Solar systems, and electric vehicles. It’s general, CNG, Deep cycle batteries can be used with a vehicle of any type including Honda City, Civic, Toyota GLI, XLI, Vitz, Suzuki Mehran, Buses, Tractors, etc. M Type for Car, Truck, and Buses. D Type for Heavy Duty UPS and Solar systems. U Type for UPS, Bus, and Truck. *All mentioned prices are after the 3% Discount. Its general series consists of more than 22 types of batteries with a different number of plates and capacity and it can be used with different models of vehicles. These batteries consist of plates ranging from 5 to 33 and A.H 20 hours from 15 to 187. Deep cycle batteries are capable of repeated charge and discharge cycle are required such as electric vehicles, solar systems, etc. When you purchase a new deep cycle battery, its capacity will be limited because it needs at least 10 cycles to reach its full capacity. For ensuring its long life, correct parameters of charging are required. Four models are available in deep cycle series: D650, D765, D1450, and D2400. A deep cycle and all other types of battery should not be discharged beyond 80% of its capacity otherwise it will lose some of its capacity and it will also decrease its life. To prolong its performance and life a battery should be used 35% of their power up to 1.200 gravity. You can check the table for the measurements of the depth of discharge with checking the gravity instrument. The usage of a battery at a high temperature shortens their life-span. Therefore inverter should be stopped to charge if electrolyte temperature exceeds 50-degree centigrade. It should be kept in a ventilated area. The batteries should be charge with a 14.4V constant voltage with the charging current at 10 Ampere. The charging current will be maintained at 10 amperes until the battery voltage rises to 14. volts. For ensuring, that all the cells are at the equal charge level it is recommended that the batteries be given an extra 14.6 volts for at least 2 hours in a month. Terminal should be cleaned regularly. To avoid the corrosion, grease the terminals. A little warm water can be used to clean the corrosion on the terminals. Electrolyte level should me maintained regularly by adding distilled water only. The electrolyte should be at the Max. level. Too little water or above the maximum level will decrease its performance. The distilled water should be added after the fully charge. Should be kept above the ground and in well ventilated space. During charging, the temp. should not be exceed above 50 degree centigrade. Charging current should be not more than 10 Ampere. Floating voltage should be 13.8 V.
Cut off voltage should be not more than 14.4 V.
You should wear goggles, while working near the it. 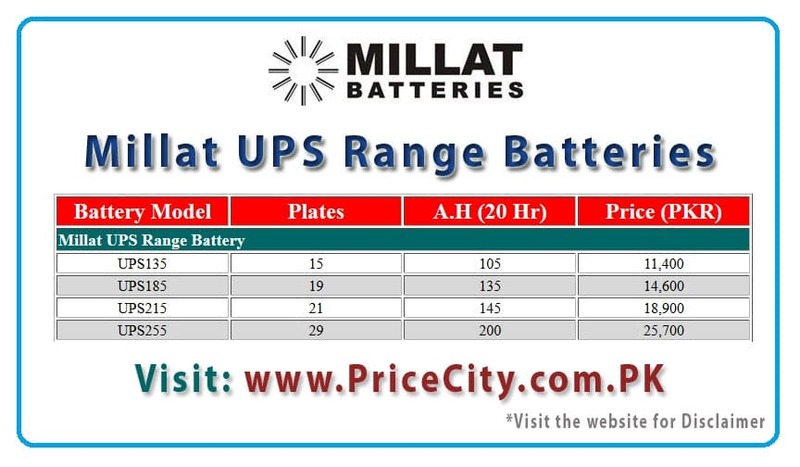 Millat UPS range batteries are specially designed for the UPS system and plates of these batteries are thick in size and gives more backup time than traditional ones. Its UPS range models are UPS134, UPS185, UPS 215, and UPS 255. Four models are available with different specs and its models names are CNG52, CNG55, and CNG 65. The manufacturer is providing 6 months of warranty. If your product stops working before the warranty expiry date, you can claim it from the company dealer, shop, etc. The warranty card comes with each product and you must fill this card from the seller. You can download or print the price list by saving the picture below. Disclaimer: Dear visitors, we tried our best, but we cannot guarantee that the Price & other info. of products on this page is 100% correct (Human error is possible). For correct Specs & Price always visit the nearest local shop/dealer. We (PriceCity.com.PK) does not sell any product. We only provide specifications, features, and price in Pakistan of different products from different stores around Pakistan.